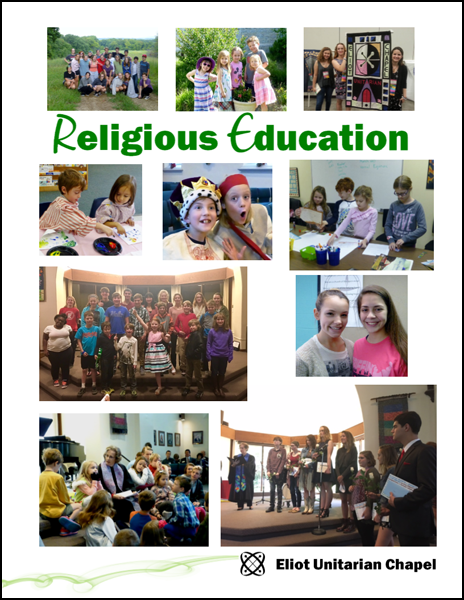 All Eliot Chapel families should complete a registration form for children and youth actively participating in the Religious Education program each year. Current information enables us to keep you informed about church events and activities throughout the year and, most importantly, helps keep children and youth safe while under the supervision of Religious Education staff, childcare workers, and program volunteers. The Religous Education program is dependent on the generous financial contribution of Eliot Chapel members and friends through their annual pledges to the church's operating budget. From time to time, a fee may be charged for a specific activity or event. It is the expectation that all parents and guardians of participating children and youth will support their congregation, to the best of their ability, through an annual pledge to Eliot Chapel. If you have not made a financial pledge for 2018-2019, please access a current pledge card here. For more information about annual pledges, please contact the church administrator at admin@eliotchapel.org. Stop by our bulletin boards when you are in the building. I am interested in receiving updates and reminders via text message. As a courtesy to Eliot Chapel members and friends, a directory of contact information is made available for use by folks in the Eliot community, which includes names of family members, primary phone number, address, and email address. This information is not shared with other organizations. I wish for the information above (if different from primary parent/guardian) to be included in the 2018-2019 Eliot Chapel directories. I understand the Eliot Unitarian Chapel Image Use Procedure. Eliot Chapel's Religious Education program and the larger Eliot congregation rely on the time and talents of many individuals each and every year. The opportunities below are our most-needed positions. Please indicate where you are willing and able to assist. All volunteers will be provided instructions and support throughout the year. Check this box if you are currently serving in another church leadership capacity. Check this box if you are interested in learning about opportunities to participate in the Eliot Chapel Music Program in 2018-19 (Jan Chamberlin will contact you). For children in 1st-5th grade only: Check this box if your child(ren) is interested in participating in the Chalice Choir (Jan Chamberlin will contact you). Check this box if you are interested in learning about Covenant Group ministry at Eliot Chapel. Does your child/youth play a musical instrument or have a special talent? If so, please indicate. Does your child/youth have any health concerns, dietary restrictions, or other concerns we should be aware of? If yes, please indicate. Does your child/youth play a musical instrument or have a special talent? If yes, please indicate.